A counterpart to its Air2G2 aerification machine, GT AirInject launched the Air2HP portable aerifier tool. The Air2HP can be used to aerate tight spaces such as flowerbeds and tree bases, as well as for spot treatments on turf and in sand bunkers. The handheld device uses a single probe to inject air beneath the surface of the turf, fracturing compacted soil as far as 40 inches below. 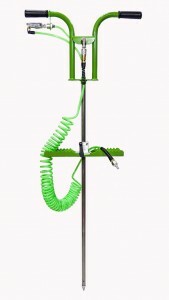 The Air2HP requires an external air compressor or may be used in conjunction with the Air2G2.